Cello's iViewer television has only just been announced, but TechRadar was at the launch event to get to grips with a television that integrates the iPlayer. Cello iViewer is an early look at television that integrates internet content, with the capacity to watch certain vodcasts – like Diggnation – view YouTube clips and, most importantly get a very decent-looking experience with the iPlayer. Cello is hoping that it can bring the iPlayer to a whole new audience with the television - which also has an integrated DVD Player and Freeview - namely those that are looking for a simple way to get catch-up TV. It's certainly not a candidate for any size awards – the integrated kit means that you get a chunky looking screen, but it's not an especially major price to pay for the added functionality. The quality of the LCD panel has been a sticking point for prior Cello TVs, but at first look the quality is significantly better on both the 32- and 25-inch sets of the iVision range. The television function is not any major leap from any other integrated Freeview TV, the EPG and the information are as you would expect, neat, tidy and well designed. The TV comes with three widgets built in at the moment - with more likely to follow. The News and Sport widgets, a little disappointingly, use just the BBC feeds, and the weather comes from the Met Office - but is hard coded to your IP address - so you could end up with weather from a little less locally than you would ideally want. 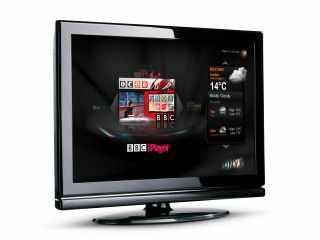 The more exciting aspects deserve a more in-depth look, starting with the television's big unique selling point – the integrated iPlayer. Interestingly, the service launches with a fully branded button on the remote control. It's a nice touch, making the service much easier to find for the masses. The user interface is straightforward and programs are easy to find, using a simple grid system and bold design. The first menu gives 'highlights', 'last played' and 'just in' options – with other options in tabs. The TV tab gives channels categories and most popular, the Radio tab replicated this functionality and there is also a search option. The search option is obviously made more clunky by the entry of text (not something a remote was made for) but it's perfectly functional and returned what you would expect. The other internet channels are, currently, a little sketchy – with the user interface a little less obvious than the iPlayer section, finding things was, nevertheless, straightforward and simple enough to not confuse those less familiar with the internet. YouTube clips in lower resolution look, well, abysmal – but what would you expect? The higher quality clips are fine, and the other internet content includes Disney Movies Preview, Movie Rush, Autocar Magazine, Sky Sports Boots and All, the CNN daily video podcast, Jamie's Ministry of Food, Delicious TV Veg, Revision 3 Diggnation and the Larry King video podcast. The Onyx software – which sticks with the British theme that includes Durham-based Cello – was designed by Oregan Networks, and feels really nicely thought out. Let's be frank: this isn't really a technophile's television, as they will be perfectly happy with one of the other ways to get iPlayer and will probably prefer to wait for a Canvas product, should the project be ratified by the BBC Trust. But, although the iViewer may be a terrible name, this is certainly a TV that should sell; well designed, impressively accessible and with some really nicely thought-through added functionality. The first sets will be available in Marks & Spencer – with the Cello branding removed – so you'll have to keep an eye out for the iViewer brand. More outlets will begin to stock it in a few months.